"Metal Monster Panics the Populace!" 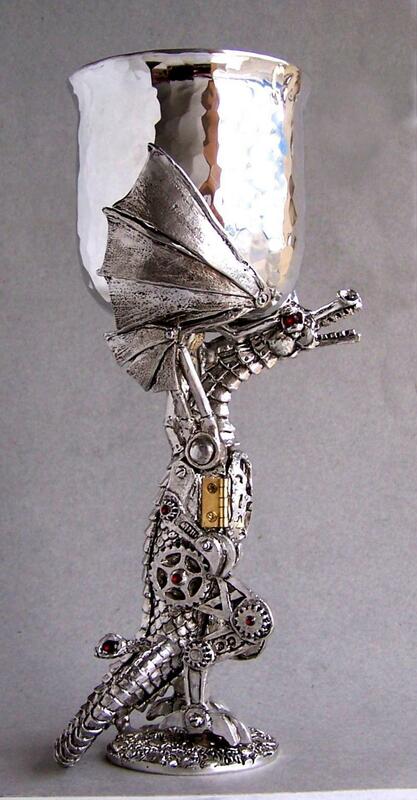 This mechanical steam-powered dragon is all gears and riveted-metal plates. The brass hinges really work, letting the door open to reveal the mustachioed man at the controls; foot pedals, levers and gauges. And to keep it "street safe", the crystal at the end is the "tail light"! By far the most complicated goblet we've ever made, it is an individually numbered limited edition goblet. It holds 16 ounces, and we make it by hand from lead-free pewter. *Email us for additional photos!